Carpet beetles may be one of those household pests where you had no idea that they were a potential threat until you found them causing havoc in your own home. 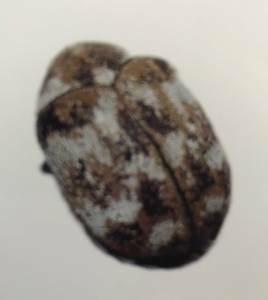 We know that our carpets can offer a great home to all kinds of dirt and bugs, given half a chance, but the carpet beetle is one that many homeowners are less familiar with. So what do we need to know about these creatures and what can we do if we find them? There are two important stages in the life of the carpet beetle. There are is a good chance that you may see examples of both and not realise that they are the same creature. The first is the larval state. The larvae are arguably more alarming than the adult. It is a large, grub-like creature found within the carpet or other fabrics. These creatures then transform into 4-6mm variegated beetle that has a colouration and pattern not dissimilar to that of clothes moths. In fact, their habits are similar to the moths in regard to their chosen habitats and food sources. Why Are Carpet Beetles Such A Problem? Carpet beetles like to find a home in animal-based materials such as hair, fur and wool, which is one of the reasons why they love to spend their time in carpets and rugs. They are also found in clothing, some forms of insulation and even some dried foods, if offered the opportunity. This is where you need to look for signs of infestation. The sight of these beetles and larvae may not be the first clue to an infestation of the home. Instead, you may notice damage to the carpeting and clothing where they have eaten. You may also find the casts of their skins after transformation or spot their sand-like droppings. What To Do If You Believe That You Have Carpet Beetles In The Home. One of the most obvious solutions for dealing with these creatures is to provide a deep clean and vacuum on all carpet and rugs. It also helps to do the same to cushion covers and other items of upholstery where possible. Also, check for problems with stored clothing, give everything a clean and package them up in plastic to avoid the risk of further contamination. The problem here is that while you are attacking the main sources and signs of damage, there could be areas that are missed. Calling In The Professionals At Sunnystate Pest Control. This is why it pays to bring in a professional team for a full inspection and treatment of these surfaces. Experts can inspect every potential area of the home where these creatures may linger. They know the best places to look for these creatures and their evidence. A full inspection increases the chance of eradication. The next step for these pest control specialists is to add a liquid insecticide to the edges of the carpet, as this is the most common place to find them. This should kill off many adults. The next step is a deeper treatment of the underlay using a permethrin dust and electric blower. As you can see, this really is one for the professionals only.